The importance of sulfide minerals in ores has long been, and continues to be, a major reason for the interest of mineralogists and geochemists in these materials. Determining the fundamental chemistry of sulfides is key to understanding their conditions of formation and, hence, the geological processes by which certain ore deposits have formed. This, in turn, may inform the strategies used in exploration for such deposits and their subsequent exploitation. In this context, knowledge of structures, stabilities, phase relations and transformations, together with the relevant thermodynamic and kinetic data, is critical. As with many geochemical systems, much can also be learned from isotopic studies. The practical contributions of mineralogists and geochemists to sulfide studies extend beyond areas related to geological applications. The mining of sulfide ores, to satisfy ever increasing world demand for metals, now involves extracting very large volumes of rock that contains a few percent at most (and commonly less than one percent) of the metal being mined. This is true of relatively low value metals such as copper; for the precious metals commonly occurring as sulfides, or associated with them, the mineable concentrations (grades) are very much lower. The "as-mined" ores therefore require extensive processing in order to produce a concentrate with a much higher percentage content of the metal being extracted. Such mineral processing (beneficiation) involves crushing and grinding of the ores to a very fine grain size in order to liberate the valuable metal-bearing (sulfide) minerals which can then be concentrated. In some cases, the metalliferous (sulfide) minerals may have specific electrical or magnetic properties that can be exploited to enable separation and, hence, concentration. More commonly, froth flotation is used, whereby the surfaces of particles of a particular mineral phase are rendered water repellent by the addition of chemical reagents and hence are attracted to air bubbles pulsed through a mineral particle-water-reagent pulp. An understanding of the surface chemistry and surface reactivity of sulfide minerals is central to this major industrial process and, of course, knowledge of electrical and magnetic properties is very important in cases where those particular properties can be utilized. In the years since the publication of the first ever Reviews in Mineralogy volume (1974, at that time called MSA "Short Course Notes") which was entitled Sulfide Mineralogy, sulfides have become a focus of research interest for reasons centering on at least two other areas in addition to their key role in ore deposit studies and mineral processing technology. It is in these two new areas that much of the research on sulfides has been concentrated in recent years. The first of these areas relates to the capacity of sulfides to react with natural waters and acidify them; the resulting Acid Rock Drainage (ARD), or Acid Mine Drainage (AMD) where the sulfides are the waste products of mining, has the capacity to damage or destroy vegetation, fish and other aquatic life forms. These acid waters may also accelerate the dissolution of associated minerals containing potentially toxic elements (e.g., As, Pb, Cd, Hg, etc.) and these may, in turn, cause environmental damage. The much greater public awareness of the need to prevent or control AMD and toxic metal pollution has led to regulation and legislation in many parts of the world, and to the funding of research programs aimed at a greater understanding of the factors controlling the breakdown of sulfide minerals. The second reason for even greater research interest in sulfide minerals arose initially from the discoveries of active hydrothermal systems in the deep oceans. The presence of life forms that have chemical rather than photosynthetic metabolisms, and that occur in association with newly-forming sulfides, has encouraged research on the potential of sulfide surfaces in catalyzing the reactions leading to assembling of the complex molecules needed for life on Earth. These developments have been associated with a great upsurge of interest in the interactions between microbes and minerals, and in the role that minerals can play in biological systems. In the rapidly growing field of geomicrobiology, metal sulfides are of major interest. This interest is related to a variety of processes including, for example, those where bacteria interact with sulfides as part of their metabolic activity and cause chemical changes such as oxidation or reduction, or those in which biogenic sulfide minerals perform a specific function, such as that of navigation in magnetotactic bacteria. The development of research in areas such as geomicrobiology and environmental mineralogy and geochemistry, is also leading to a greater appreciation of the role of sulfides (particularly the iron sulfides) in the geochemical cycling of the elements at or near the surface of the Earth. For example, the iron sulfides precipitated in the reducing environments beneath the surface of modern sediments in many estuarine areas may play a key role in the trapping of toxic metals and other pollutants. In our understanding of "Earth Systems," geochemical processes involving metal sulfides are an important part of the story. The main objective of the present text is to provide an up-to-date review of sulfide mineralogy and geochemistry. The emphasis is, therefore, on such topics as crystal structure and classification, electrical and magnetic properties, spectroscopic studies, chemical bonding, high and low temperature phase relations, thermochemistry, and stable isotope systematics. In the context of this book, emphasis is on metal sulfides sensu stricto where only the compounds of sulfur with one or more metals are considered. Where it is appropriate for comparison, there is brief discussion of the selenide or telluride analogs of the metal sulfides. When discussing crystal structures and structural relationships, the sulfosalt minerals as well as the sulfides are considered in some detail (see Chapter 2; also for definition of the term "sulfosalt"). However, in other chapters there is only limited discussion of sulfosalts, in part because there is little information available beyond knowledge of chemical composition and crystal structure. Given the dramatic developments in areas of research that were virtually non-existent at the time of the earlier reviews, major sections have been added here on sulfide mineral surface chemistry and reactivity, formation and transformation of metal-sulfur clusters and nanoparticles, modeling of hydrothermal precipitation, and on sulfides in biosystems. 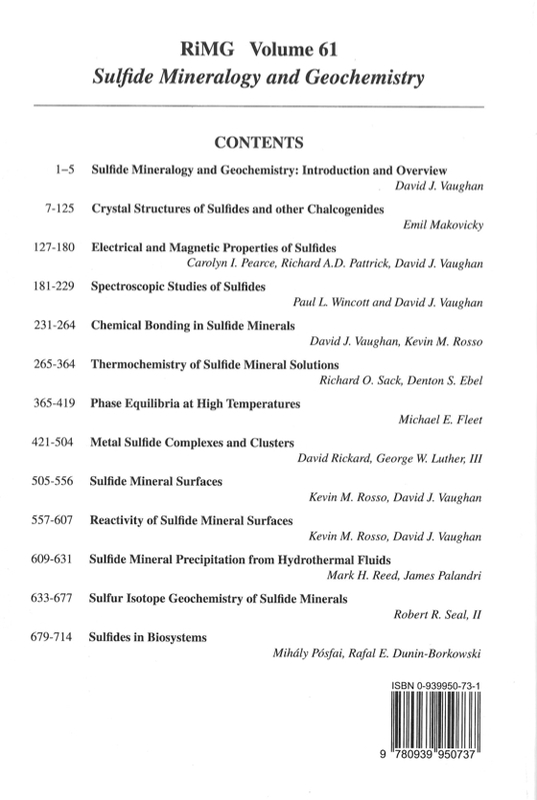 However, it should be emphasized that the growth in the literature on certain aspects of sulfide mineralogy over the past 20 years or so has been such that comprehensive coverage is not possible in a single volume. Thus, the general area of "sulfides in biosystems" is probably worthy of a volume in itself, and "environmental sulfide geochemistry" (including topics such as oxidative breakdown of sulfides) is another area where far more could have been written. In selecting areas for detailed coverage in this volume, we have been mindful of the existence of other relatively recent review volumes, including those in the RiMG series. It has also been our intention not to cover any aspects of the natural occurrence, textural or paragenetic relationships involving sulfides. This is published information that, although it may be supplemented by new observations, is likely to remain useful for a long period and largely not be superceded by later work. In the following chapters, the crystal structures, electrical and magnetic properties, spectroscopic studies, chemical bonding, thermochemistry, phase relations, solution chemistry, surface structure and chemistry, hydrothermal precipitation processes, sulfur isotope geochemistry and geobiology of metal sulfides are reviewed. Makovicky (Chapter 2) discusses the crystal structures and structural classification of sulfides and other chalcogenides (including the sulfosalts) in terms of the relationships between structural units. This very comprehensive survey, using a rather different and complementary approach to that used in previous review volumes, shows the great diversity of sulfide structures and the wealth of materials that remain to be characterized in detail. These materials include rare minerals, and synthetic sulfides that may represent as yet undescribed minerals. Pearce, Pattrick and Vaughan (Chapter 3) review the electrical and magnetic properties of sulfides, discussing the importance of this aspect of the sulfides to any understanding of their electronic structures (chemical bonding) and to applications ranging from geophysical prospecting and mineral extraction to geomagnetic and palaeomagnetic studies. Rapidly developing new areas of interest discussed include studies of the distinctive properties of sulfide nanoparticles. Wincott and Vaughan (Chapter 4) then outline the spectroscopic methods employed to study the crystal chemistry and electronic structures of sulfides. These range from UV-visible through infrared and Raman spectroscopies, to X-ray emission, photoemission and absorption, and to nuclear spectroscopies. Chemical bonding (electronic structure) in sulfides is the subject of the following chapter by Vaughan and Rosso (Chapter 5), a topic which draws on knowledge of electrical and magnetic properties and spectroscopic data as experimental input, as well as on a range of rapidly developing computational methods. Attention then turns to the thermochemistry of sulfides in a chapter by Sack and Ebel (Chapter 6) which is followed by discussion of phase equilibria at high temperatures in the review by Fleet (Chapter 7). Sulfides in aqueous systems, with emphasis on solution complexes and clusters, forms the subject matter of the chapter written by Rickard and Luther (Chapter 8). 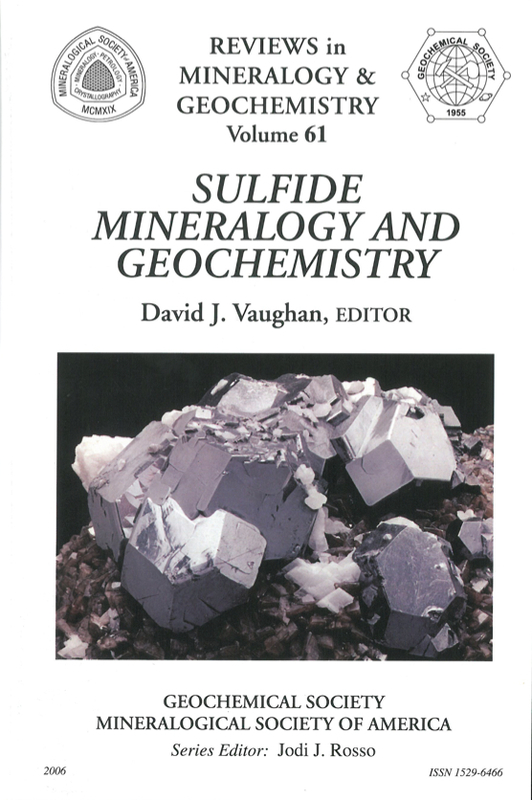 Sulfide mineral surfaces are the focus of the next two chapters, both by Rosso and Vaughan. The first of these chapters (Chapter 9) addresses characterization of the pristine sulfide surface, its structure and chemistry; the second (Chapter 10) concerns surface reactivity, including redox reactions, sorption phenomena, and the catalytic activity of sulfide surfaces. Reed and Palandri (Chapter 11) show in the next chapter how much can now be achieved in attempting to predict processes of sulfide precipitation in hydrothermal systems. The final chapters deal with two distinctive areas of sulfide mineralogy and geochemistry. Seal (Chapter 12) presents a comprehensive account of the theory and applications of sulfur isotope geochemistry; sulfur isotope fractionation can provide the key to understanding the natural processes of formation of sulfide deposits. In the final chapter, Posfai and Dunin-Borkowski (Chapter 13) review the rapidly developing area of sulfides in biosystems, discussing aspects of both sulfide mineral-microbe interactions and biomineralization processes involving sulfides.